Novozymes’ annual report is based on the concept of materiality, to ensure that the content is significant and relevant to readers. Our materiality matrix highlights the 16 most material financial and nonfinancial themes and acts as a guide for determining the topics we include in our annual disclosure. 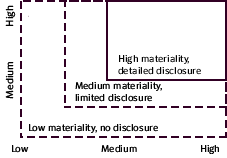 The illustration below is a snapshot of the upper-right quadrant of Novozymes’s materiality matrix and represents issues in the high material category only. A full list of all material topics can be found under "Disclosure on material issues". In 2018, we studied relevant macrotrends and changes in the internal and external environment to understand the impact they have on our current materiality matrix. As a result of this process, we identified one new issue in the economic category: Trade policies. Changing global trade policies are impacting businesses all over the world. Therefore, it is important that we manage this issue to minimize the impact it may have on Novozymes’ business. All other issues remain unchanged. We also strengthened our assessment approach to determine which SDG goals and targets we could contribute to by addressing the material issues through our business. We now highlight material issues where we believe our actions and initiatives to address the issue can significantly contribute to specific SDG targets. For more details, see "Value chain assessment", which includes all our material issues. Novozymes’ materiality assessment is a systematic and rigorous process that integrates inputs from trend analysis and external stakeholders. It also involves internal engagement with relevant functions, including leaders from our business divisions, Investor Relations, Risk Management & Controls, Public Affairs and Corporate Sustainability. This process results in the identification of 1) key relevant macrotrends and 2) material economic and environmental, social and governance (ESG) issues, which are illustrated through a materiality matrix. Novozymes conducts a comprehensive materiality assessment every two to three years to identify current issues material to our stakeholders and our business. This comprises a review of the assessment methodology, detailed desktop research to identify the latest trends and ESG issues, and active and extensive stakeholder engagement. Between assessments, we conduct annual materiality refreshes, where we review our existing material issues for their relevance and importance to Novozymes and our stakeholders by means of evidence-based research and analysis of stakeholder opinion through proxy sources.